Tikku is a pair of connected musical sticks, that will allow you to generate the sound you imagined without any constraint. 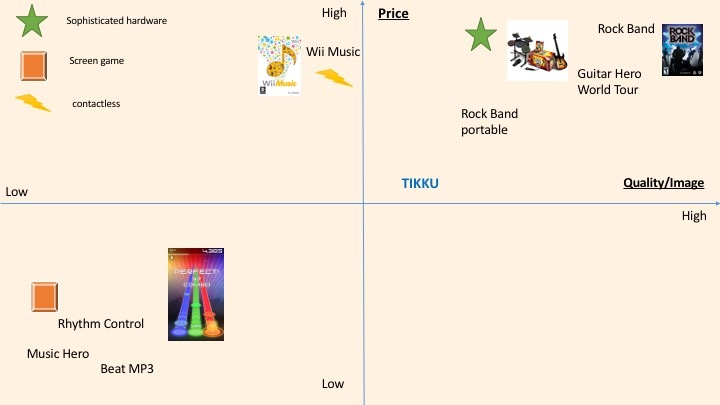 Tikku is all about entertainment in music, in the same idea as Guitar Hero or Wii, but with a great advantage of portability. Want to feel like a musician for a day? 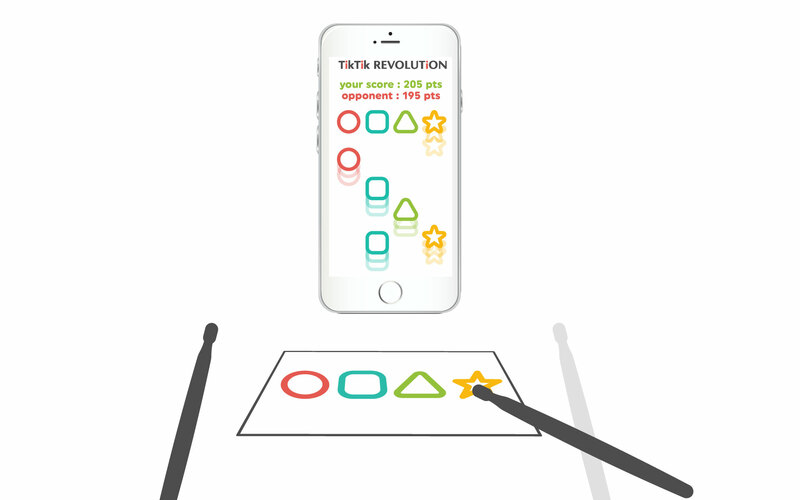 Connect your Tikku sticks and start playing! 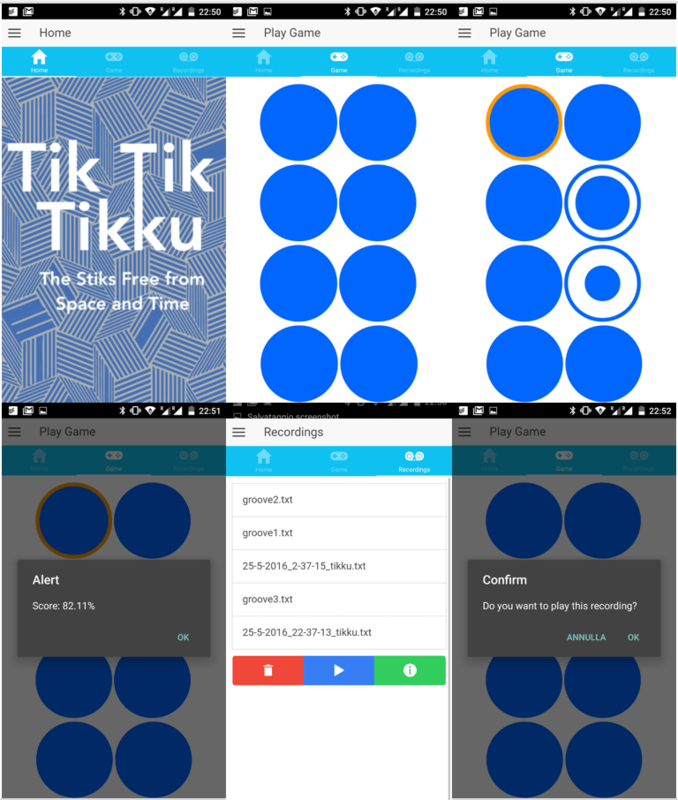 Tikku are light and can be paired with any device. Camp, beach, friend’s house? You choose where to bring them! Airdrums do not suppose the purchase of expensive installations, nor money spending for music courses. With Tikku you do not face boring practicing hours and solfeggio. Enjoy only the pleasant side of music playing! To help you understand how it works and guide you with visual indications. Open the app and connect by Bluetooth. That’s it! Launch the game and follow the circles on the screen to explore the space around you. Turn the metronome on to help you keep the rhythm or keep the track of your performance by using the recording option. Register in Tikku community to share multi-player sessions! 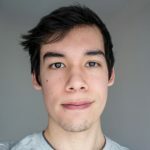 Born in 1993 in Italy, Ludovico completed his bachelor in electrical engineering in Rome, after which he started his master studies at EPFL, in Robotics and autonomous systems. He loves snowboarding, tennis and canoeing and he's always available for a chess match. He plans to go to Mars one day. Szabolcs was born in 1992 and grew up in Hungary. He did his Bachelor studies in electrical engineering with a specialization in embedded systems at Budapest University of Technology and spent an exchange semester in École Centrale Paris. Currently he's following MSc. studies in Information Technologies at EPFL's Electrical Engineering department. He loves traveling, skiing, tennis, gastronomy and always ready to burn up the dance floor. 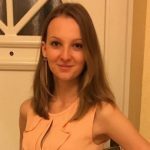 After obtaining a Bachelor of Science in Management, Svetlana decided to focus on Management in the area of Information Systems. She is now doing a Master, working in the EMBA HEC Lausanne and playing piano or organ in the church in her spare time. She speaks 4 languages: Russian, French, English and German and recently started to learn Chinese. Adrian is an industrial designer. Born in California, he spent his childhood between the US and France. He obtained a BTS in Industrial Design in 2014 at Condé Lyon, and is currently continuing his industrial design studies at ECAL. Berenice is a third year Bachelor at Ecal in the Interaction Design section. She discovered this section through the open doors of the school , it was a true discovery. 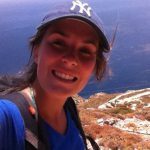 She always loved the interaction with others and it is a playful and fun way for her to interact with objects, subjects and people. 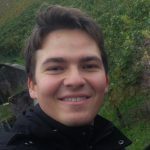 Israel Cayetano is a Mexican student of the Master in Microengineering at EPFL. 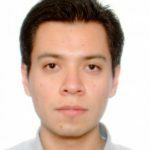 He holds a bachelor’s degree in Mechatronics from the Tecnológico de Monterrey, where he graduated obtaining a national prize for outstanding performance. He has participated in international programs in France and Germany regarding the field of industrial automation. Recently, he has worked on projects concerning signal processing. He has also collaborated in projects focused on improving the quality of education. He is passionate about technological advances, innovation, languages, world history and music. Here comes the last day in China! We cannot believe CHIC is almost finished! It is our last day and the noisiest team Tikku still has a lot of work to do. Yesterday the entire order from 3D print was shipped to our hotel. Quickly, we noticed that the space inside the sticks were too tight to fit the PCB. Adrian is actually refining the shape. In one hour we will receive the shell and mount the final version of the sticks! Rrrrrrr drumroll! Pressure is on us! and discovered how tiered we all are. to work with team Aimo. when it was time for dinner. we had to pitch in front of the TV. see you tomorrow at Huaqiangbei ! Today, thanks to the late start, we had the chance to get our well deserved sleep after the long program of yesterday. It felt so good! And we were all looking forward to the last company visits of CHIC 2016. After a short and quick bus trip (without traffic jam!!! 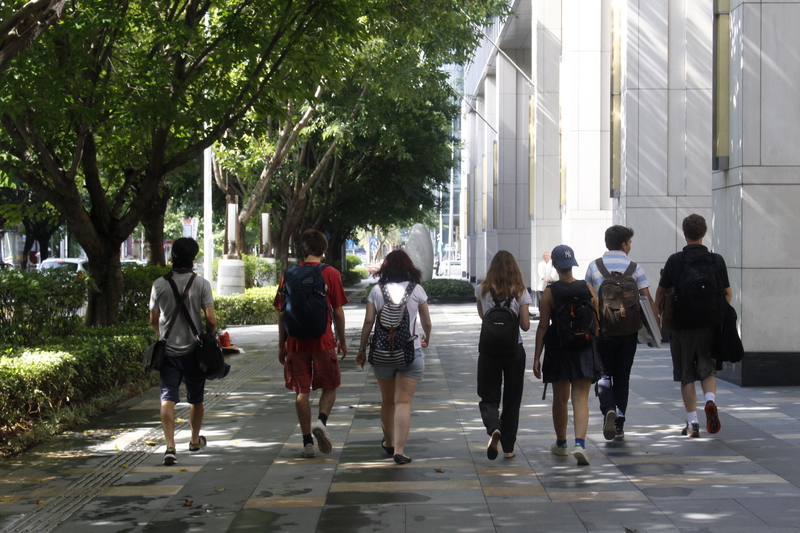 ), we arrived to DJI’s headquarters in Shenzhen. Thanks to our kind guide, Tingting, we first familiarized with the products of DJI. Beside the famous Phantom series, that probably everyone knows, they also develop many different drones for professional usage. 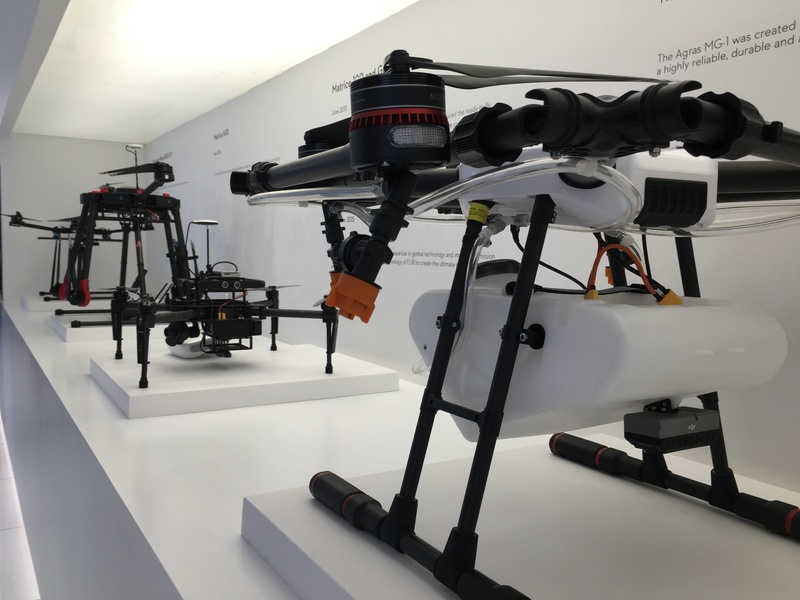 With these devices, DJI is primarily targeting the film making industry, but they also offer solutions for the agricultural sector and RC hobbyist as well. And their product line is constantly expanding, so get ready for new exciting solutions! After the visit of the showroom, we attended a short corporate presentation and a Q&A session with engineers, designers and marketing specialists in order to get an overview of the company’s history, activity and intentions. As we learned, DJI was founded only ten years ago by an HKUST student, Frank Wang. 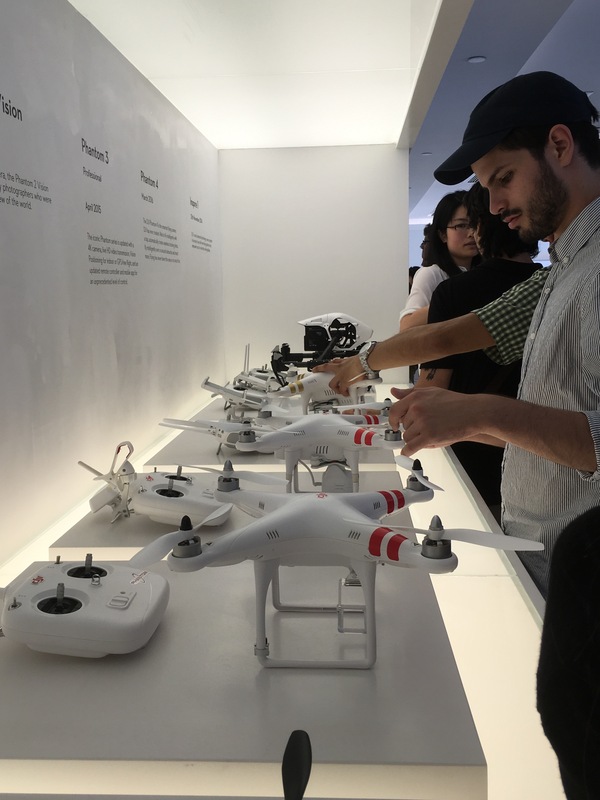 Although, the first years were incredibly hard and challenging, over the last years, DJI has become the number one company in the field of consumer drones with an industry leading technology and a stunning 70% market share. Although, they have more and more competitors, due to high level of R&D investments, they are likely to reserve their position in the following years. A real success story, that can be a good example and inspiration for all of us! After a nice Chinese lunch next to DJI`s office, we got on the bus again to head to the offices Beijing Genomics Institute. BGI is one of the world’s premier genome sequencing centers, headquartered in Shenzhen. Their research is focused on developing solutions for the current and future problems of China and the World based on the large amount of information obtained by DNA sequencing. Among other things, they work on the recognition and treatment of genetically heritable diseases as well as on developing solutions for the increasing nutritional demand of the growing population. Really exciting research, that can have a great impact on our future. And an other great example, that today, China should not only be considered as the “World’s Factory”, but also as one of the leading countries in regard of research and innovation. 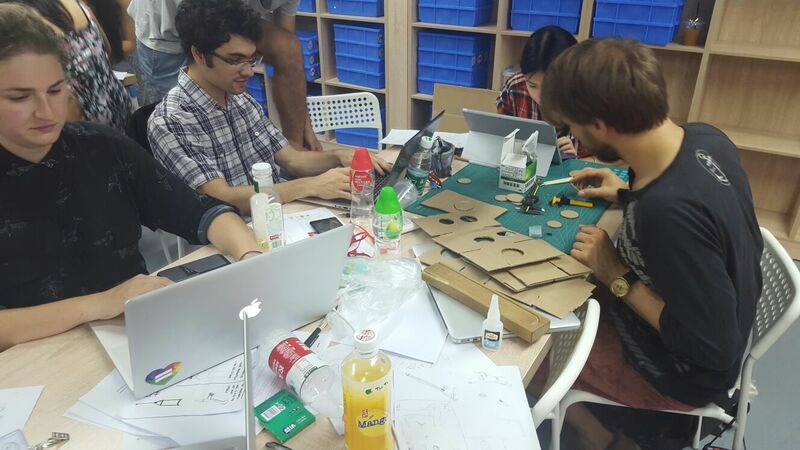 After the visit, some of the teams headed back to Seedstudio, to work on their prototypes. The time is short, so every hours spent with works matter. If you want to see the final results, get back tomorrow! 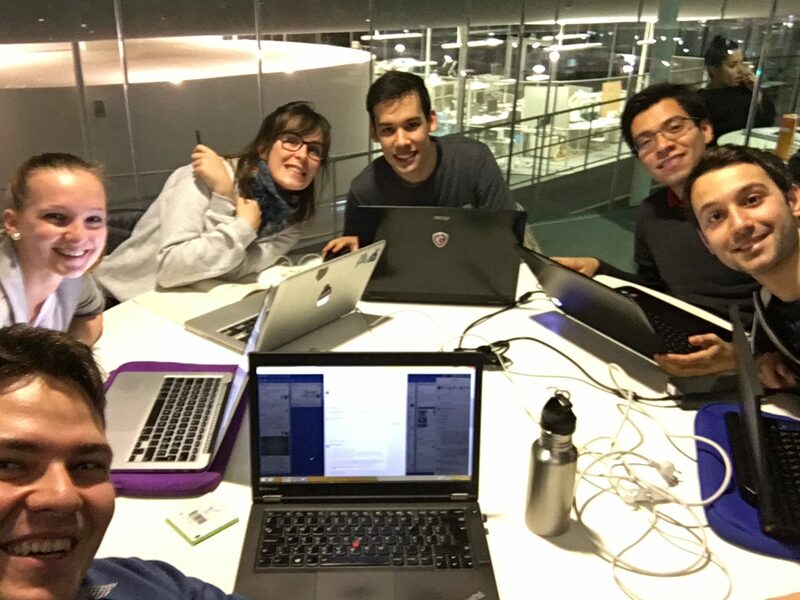 Who said that hackathons can’t be humanitarian? After a rich breakfast, we came back to SZOIL to continue the challenging humanitarian hackathon. The transfer in taxi made the whole day easier and we reached the place in great shape. 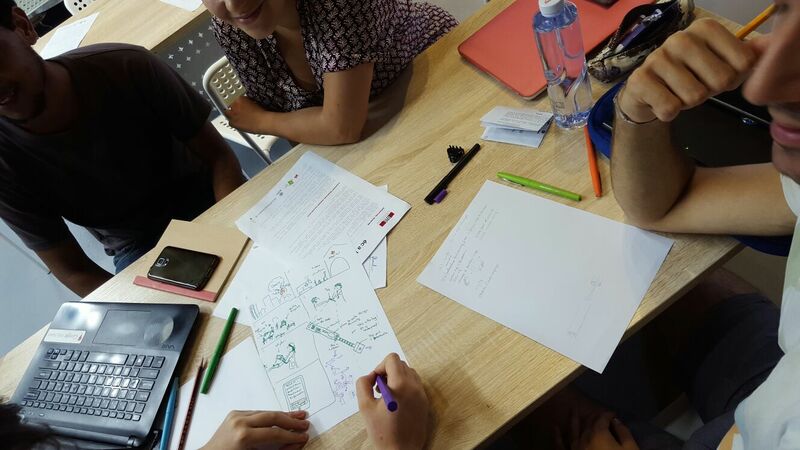 We soon started to work on our projects: the first step was to build a storyboard, which consisted in cartoon-like drawings, showing the application of our devices, as can be seen below. Working on the storyboard..not an easy job! We discovered that drawing real-life situations is far from being easy, and often the results were catastrophic at the beginning. 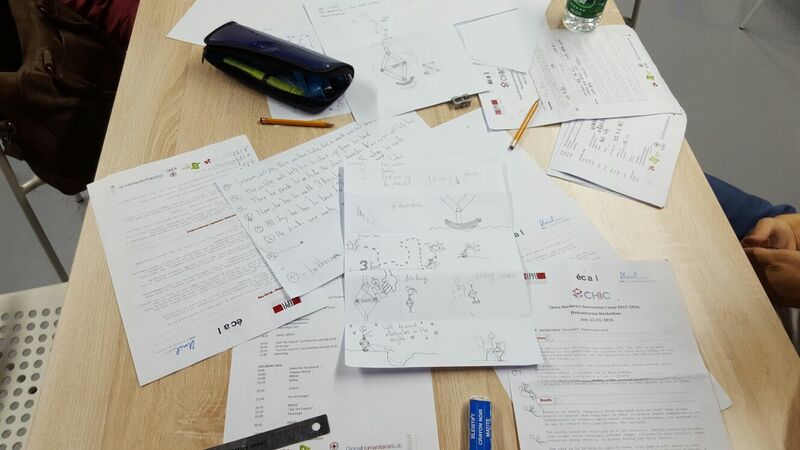 However, after a few trials, all the teams managed to produce nice and explanatory drawings. The following step was to define the details of our devices, fitting them back in the storyboard and iterating these steps until a working and complete set of specification was defined. After this, a good lunch helped us relaxing a bit and enjoying the nice weather of the day. Soon after the lunch, we started to build our prototypes: this was probably the most creative part of the day, where teams tried to find different materials and bizarre solutions for their projects. Crutches made of Chinese lego-like pieces, modelling clay used to build a dynamic bracelet, a smartphone app to show how to read a patient tag, wooden marionettes and hand-cut paper full of QR codes and many other cool solutions came to life. Art was in the air! 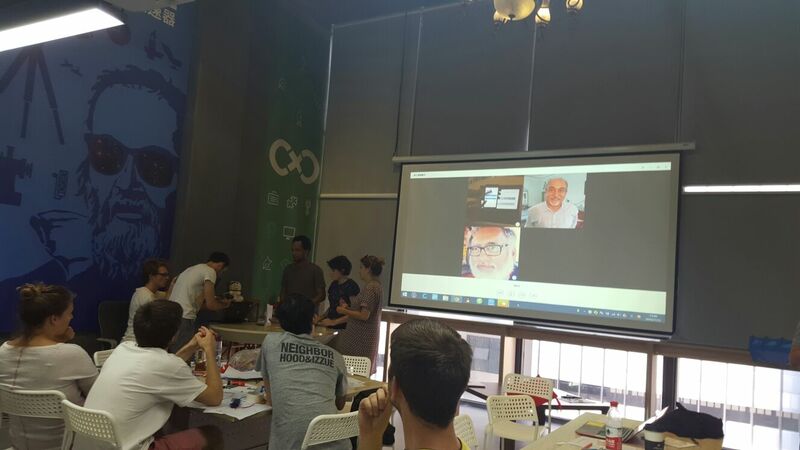 Once again a Skype session with the ICRC experts where each team had 5 minutes to present its device and receive feedback. The experts were quite amazed by the results and expressed their interest by announcing that they will try to implement our ideas! Time to relax with a chinese aperitif full of strange but delicious food and finally go party! Blogpost by LN and IC. Time is running out at Seeedstudio! All the PCBs (5 pieces) are mounted and 2 of them are working properly! The others are currently being tested. The day starts well and my team is happy :)! Everyone feels involved in the creation: the engineers are confident to let design and business people work on the hardware. Luckily, the schemas and component’s lists are very clear, so the main aspect of the work is precision. 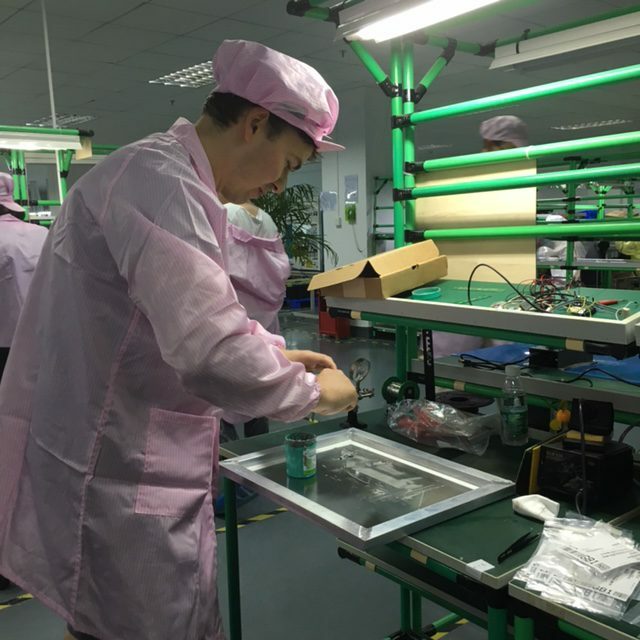 At this moment, Bérénice, Israel and Szabi are working on hand soldering of the last components, such as Bluetooth module, which can not go in the oven. Concerning the 3D printing, we are waiting for our sticks coming in 2-3 days. Then, probably Monday we will be able to mount the complete stick! Time is going so quickly and we did not noticed how Wednesday was over! Then my blogpost will cover 2 days. Yesterday the work was efficient and quick. The quick market study in the morning showed me, that there was no place for our product in the area we live. The shopping places generally contain very expensive clothes and shoes. But no musical, games or toys stores. But I found out an interesting thing, that I never have seen in Europe. In the shopping malls, which are by the way huge, you can find large areas full with games and machines. Parents come here with their children to let them play these games. To be honest, I was a bit shocked, because the place looked like a nightclub: very loud music, blinking LEDs everywhere etc… And the games there were violent: war, car racing or box! To access these areas, people have to pay. For one game the cost seems low, but let’s admit, that you do not come here to play only one game. Meanwhile the PCB guy Szabi was working on the testing to correct mistakes and the software specialists improved the code and implemented the multiplayer option. In the evening CHIC met a group of Chinese makers and presented them the projects. A part of the audience did not understand English and Yumeng interpreted each sentence of the entire CHIC presentation. What an amazing performance, which last almost 2 hours! Today in the morning we visited HAX and presented them our projects. Last night we did a lot of changes in our pitch to make it different from the others and try to improve. But actually, we went too far and the result was less convincing. But that’s how it works! We learn by making mistakes :). In the afternoon back to Seeedstudio… without the board and the stencils. Cry, tears and disappointment. Luckily we managed to bring them and worked on the remaining PCBs! Hopefully we can finish them tomorrow! Good night! Some time in the morning were spent today to define the tasks and their priorities, in order to use our time in the best way. We decided to split the tasks as following: I left the hotel to explore the market and the potential customers. Not very easy to do, as English is not commonly spoken here, so the results were kind of difficult to apply. Bérénice, Ludovico and Israel stayed at the hotel to work on the landing page and the software. Then in the afternoon, Szabi and I came to Seeedstudio to finalize the order of the components and start working on the PCB. Components arrived progressively, but at the end of the day (around 9 p.m.) the list was complete and our mind peaceful. …and I assumed the assistant’s role in a fancy pink outfit. The results look great and are ready to be tested! Seeedstudio – here we are! After some intense days in Hong Kong, pitching in front of investors and makers and visiting the HKUST, the Harbour, Panalpina and the Science Park, we finally arrived to Shenzhen, where our Tikku sticks will be manufactured. The Seeedstudio manufacture looks impressive: offices, machines and piles of fresh baked PCBs. It is time now to join the professionals and assemble our own device! Unfortunately, not all the components arrived for our order, then tomorrow the task will be to go to the electronics market, to fulfil the missing components. Then, the work on hardware will start. For the moment Israel and Szabi are working on the sensors’s calibration with the draft PCB they brought from Switzerland. Adrian is finalizing the 3D renderings, so we can submit the shape to Seeedstudio and decide whether it can be produced there or should be outsourced. Ludovico started actually to work on a key function of Tikku: the implementation of the multiplayer game option into the software. 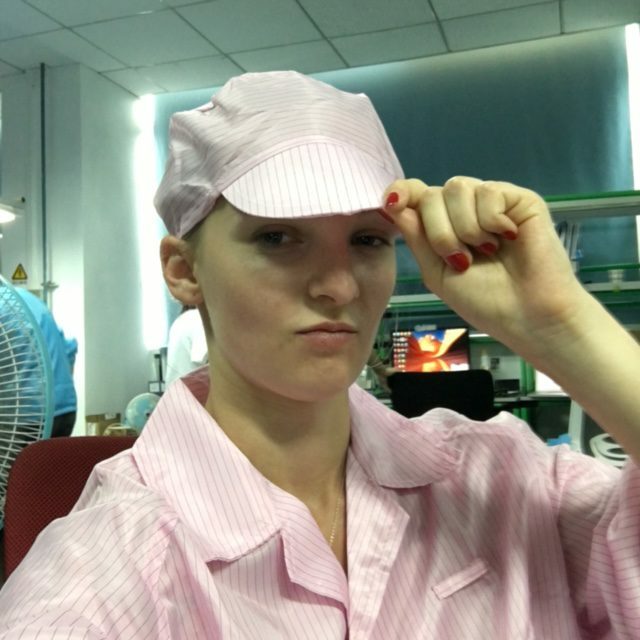 Bérénice is preparing the landing page for the website and I am working on the questions I could ask locals during my survey session in the stores of Shenzhen. We are back to present you our first game, developed by the engineering team! It’s concept is similar to Guitar Hero game, but better adapted to a mobile game and keeps the drum playing aspect. The user will first see 8 circles, each representing a virtual sector: 4 circles for the lower levels and 4 circles for the upper one. When the game starts, the circle assigned to the sector you have to hit changes. The inner part of the circle is growing up to the external ring. The contact between the internal circle and the ring defines the moment to move the stick. The movement of the stick itself is shown by the orange ring. The most precise are the movements, the better the score. As promised, the grooves played can be recorded and listened after the session. The game is still in development phase, so you will stay informed about new features ;). Here we are! The last milestone has been passed and we are going towards the China trip! Lot of work is still remaining. The pricing and costing aspects still need to be finalized, the landing page for our product created and the design of the app implemented. Time is a scarce resource as all team members are facing the semester’s end. We are impatient to make some “intensive” weeks after the exams to work on the project. Anyway, we are proud of the achievement we presented in the milestone from the technical side. The engineering team did an amazing work on the connection between the hardware and the software. The bluetooth is now perfectly working and… drumroll!!! both sticks can be connected to the app producing a clear and right sound. They are now putting everything together: low power Bluetooth connection has been finally achieved, some refinements to the sensor fusion algorithm have been added and components have been soldered on the PCB! First the Bluetooth low power module. 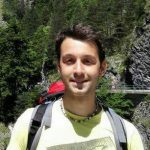 Ludovico understood how it works and which are the exact connection strings (uuid) that are used to transmit data. Then he worked on the app, to implement these connection strings, make it receive the data from the module and process it to generate the sound. With Israel, they defined 5 levels of intensity, distributed over 8 possible sounds. Besides, now is possible to listen back to the recordings, which is the base for our game (the grooves that the user will have to reproduce will be predefined recordings). The Bluetooth communication was implemented on the firmware in which now it is possible to send the intensity and sector values just when a hit is detected. Additionally, some errors were identified and corrected in order to refine the algorithm. What a good material to show for the 3rd milestone’s demo time, taking place next week! 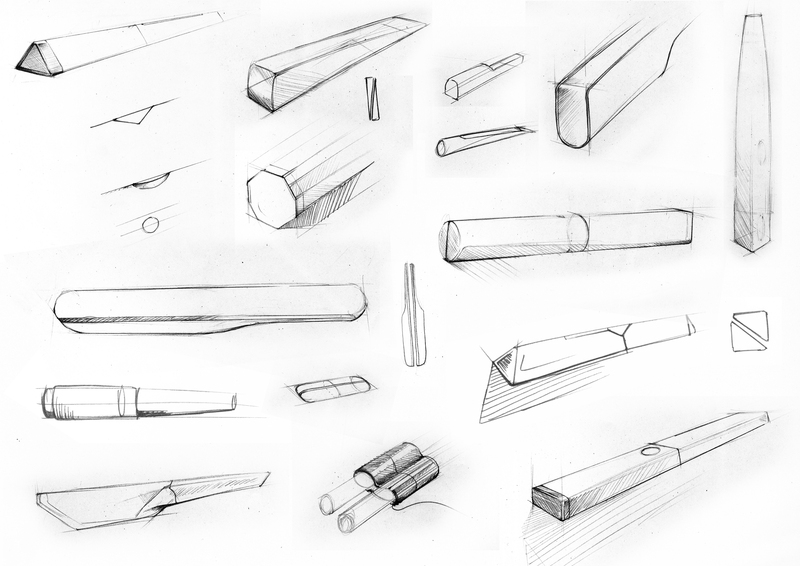 One of the biggest parts of the work for the second milestone was the design of the sticks performed by Adrian. He has been working on colors and shapes according to the engineering requirements of the PCB and other electrical components. The stick is a puzzle constituted of 3 main layers. 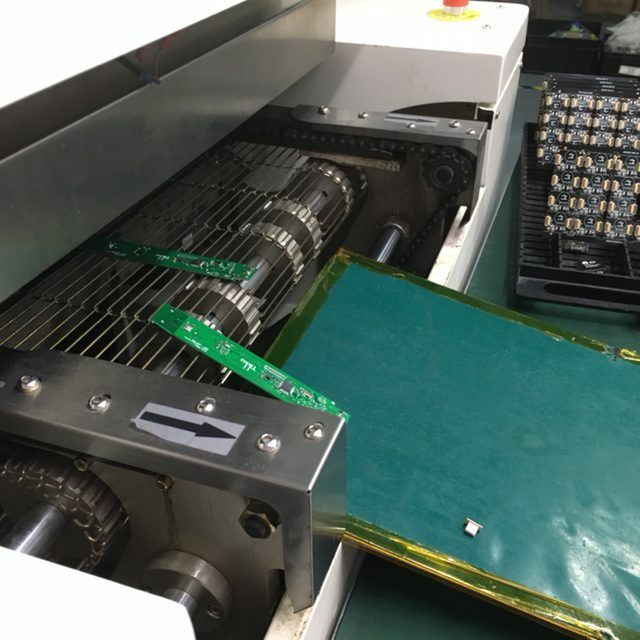 The internal layer, containing all the electronic filling and the PCB will hold inside the plastic body of the stick. This body will be probably made of ABS plastic, as it is resistant and well adapted to a toy. Finally, the external layer of the stick will be done of rubber. It will assume three roles at the same time: protect the stick from shocks, hide the USB hole and help to differentiate the sticks in group sessions. Red, green, yellow and blue are the colors for the rubber part. Why have we done this choice? These are already associated in people’s minds as colors of the digital game… Remember the colors of the symbols on xbox, playstation etc joysticks’? The surface of the stick will be smooth. Only 2 buttons will allow to control it: one for switching the stick on and off situated at the bottom of the stick, and one on the front side, circled by a LED to calibrate the stick at the beginning of the session. Difficult to believe, that only one milestone is left before going to China! We are so excited to be there although few time is left now to finish the work on the project. The engineering part is going pretty well, but let’s talk a bit business. Tikku is not isolated from its environment, so I had to make a market analysis and a second round of interviews to find our place among potential competitors. My research was done in the area of digital games. We can see a huge gap between expensive and sophisticated hardware (such as Guitar Hero and Rock Band) and very simple and cheap, often free, apps to play with the finger on the smartphone screen. The idea is to place Tikku in the middle with a good quality and lower price, than game consoles. 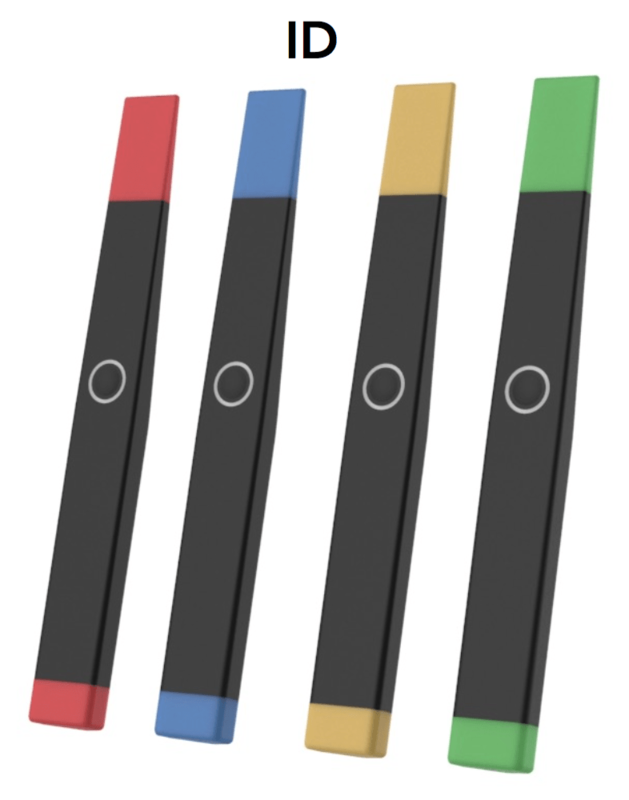 The main advantage we could have is the portability of the sticks connected to phone. In this way people can get out of the screen and play REALLY anywhere. As the project starts to materialize into PCB’s, foam prototypes, software design and scripts our team is facing challenges and limits of the ideas we have imagined. The decisions must be taken carefully, especially in interdisciplinary activities. Everything is about compromise! The ideal goal is to achieve a perfect fit between the content and the form. On one hand, a good performance of the core engineering functions (the mobile app complexity and the sticks hardware filling) is crucial to reach the minimum viable product. On the other hand, people judge the appearance, and a good presentation can play a more important role for gaining good customer’s opinion, that any other factor. Content and form are inseparable and business wants both! In order to find the right combination of content and form, two strong tandems has been build: Ludovico/Bérénice and Adrian/Szabi. They are working on combining their knowledge and come up with beautiful prototypes of hard- and software. While creating these drafts, Svetlana collects info from interviews to adapt better Tikku to customer needs. One major change occurred in value proposition. Jury’s panel gave us a very interesting idea of a game that is actually very popular in Asia. Something similar exists for smartphone screens or for game consoles, but our variant will focus on virtual, social and musical aspects. The feedback for the first milestone is there, so this week is gonna be very important in the advancement of the project. A lot of ideas was proposed by the panel concerning the technical solutions and the features for the sticks. Tikku team meets to discuss the further steps and starts to prepare for the next milestone, which is just around the corner! Some quick sketches and renderings, trying to find a shape for Tikku. The main challenge is finding a shape that is inspired from drum stick while still being different enough so that people understand it is a a completely new product and way of interacting. 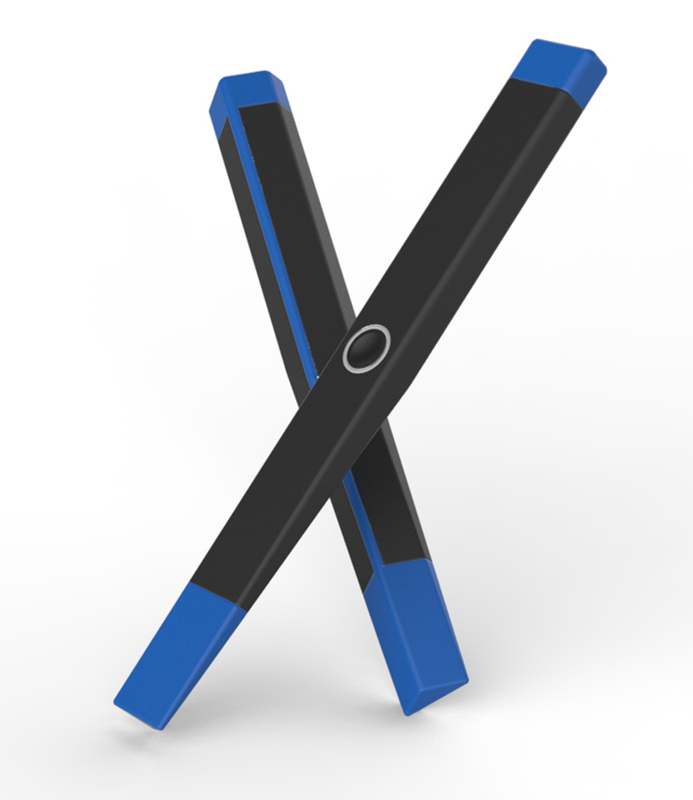 Since Tikku is sold in pairs we wanted a shape that would allow the two sticks to “clip” together for a more convenient storage, transportation and charging. We also thought that including an element of color would be a simple way of differentiating the different pairs when using multiple Tikkus session(the colors are not yet final). Last Thursday the development kits arrived and Szabi – the electrical engineer started to code some of the low-level functionalities. First, he set up the USB debugging possibility and managed to read the measurement data from the sensor that are on the development board. We won’t use the same sensors in the final application but using this board allowed a fast and cheap prototyping and the two solutions are quiet similar, so moving from one to other shouldn’t be really difficult. The second step was to set up the Bluetooth communication between the board and a smartphone. He modified an existing sample application from the producer. We had several problems both with the hardware and software, but finally Szabi managed to make it work. What you can see now on the video https://drive.google.com/open?id=0B8vqhPR5LZota3hEZzY5T2JobXc , is that the board measures the acceleration data, transmits to the smartphone through Bluetooth and based on the measured orientation of the board it changes the orientation of the displayed cube. It’s a simple example, but it was good to test at least that the Bluetooth communication works. Beside he also started to work on the schematics and examined the possible solutions of the power supply and selected components for that. Concerning the charging part, a standard USB charger will be selected. 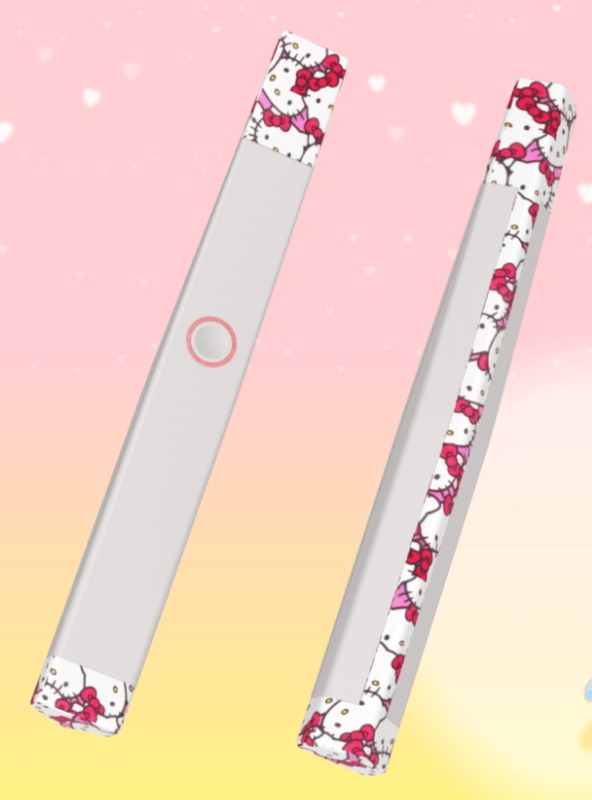 It allows the user to use the standard cables, and their will be no need to carry an extra charger or other device. A week full of good results! It’s Christmas! The parcel containing the first order of electronic components arrived this week. The playground is open! We will stay close to you, to share the first issues. 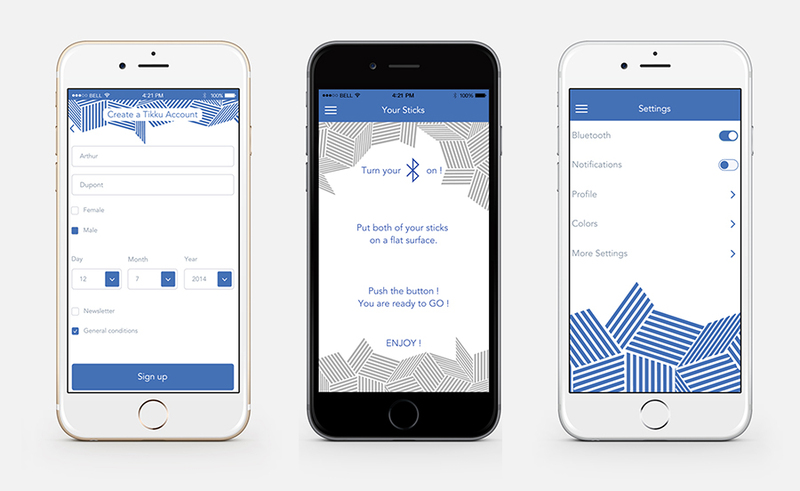 While hardware is carefully tested and prepared, Bérénice – our user experience designer sketched some variations of how could the welcome page of the smartphone app look like. Below is an example of our favorite sketches. Sketching, designing and calculating add great value to our product, but what do our customers or professionals think of all this? We sort our ideas, business models and assumptions and go out to meet real people. Students of the HEMU in Lausanne, music store vendors and just some young people, wanting to learn more about our musical sticks… We were happy to get this opportunity to meet so passionated and open-minded people. And we were much more happy to bring back necessary information to take decision about Tikku’s features. we really need to find a way of imitating the impact on drums, by using for example the vibrations. People we told with were often worried about getting lost in a completely virtual space with any landmarks. non-professional customers (no musicians) don’t want to choose between Tikku sticks as a game or a playful way of learning music. They want both. generally musicians are very conservative and do not want gadgets in their life, but surprisingly, drums are supporting very well digitalisation and market is full of electronic gadgets. the assumptions we tested the first time with much younger customer segment (cost, space, noise), are confirmed by the new older segment. 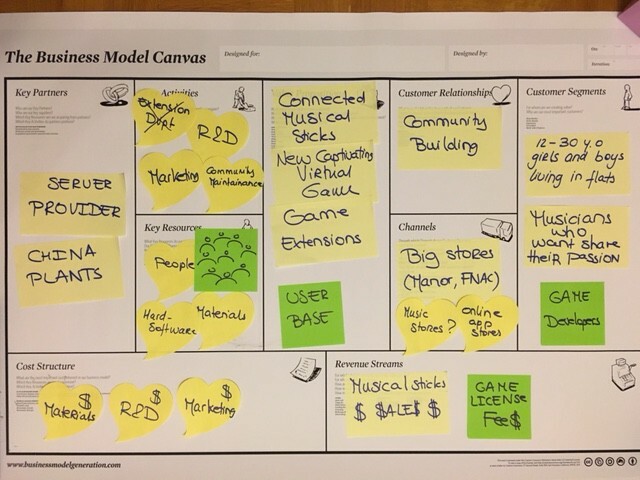 Finally the week brought us many answers to the questions, and Svetlana could manage the merging and shaping of the business models, born after the brainstorming. One of the most interesting is a double-sided model, working the same way as playstation one. We would offer 2 value propositions to 2 customer segments at the same time. The first customer segment represents our users. Their color is yellow. Our application may have a basic version, given for free with the sticks. Then the user is free to purchase app extensions in online stores to get more sophisticated games and activities – what will bring us recurrent revenues, apart sticks sales. To build these app extensions we have 2 options: work on them ourselves or outsource, by letting our API’s open. So our second customer segment are the game developers, attracted by the user base we would offer them. Doing this has several advantages like a better visibility, a faster and varied development and an interesting revenue model. While waiting impatiently for the parcel containing our first component’s order, the team makes use of time to brainstorm on the possible features Tikku drumsticks could carry. Our goal is to imagine and share all kinds of ideas and engineering solutions, even the craziest ones… Who knows? Perhaps a detail, which seems us unimportant or crazy, would become a pleasant innovation or just appreciate by our users. After our energy, as well as the our beer were at their end, we proceeded to the sorting of the results of brainstorming, which were from our point of view, the most interesting to test in the customer surveys. For instance, the leading features, that could be added to the basic model of drumsticks are the integrated metronome, allowing the player to stick to the rhythm using vibrations or LED lamps, the recording of performance or the work’s progress tracking. These are basically the ideas for Tikku seen as a musical instrument to learn drums in a cool way. For Tikku perceived as a game, then the features like competition and challenges for multiplayers or drum “karaoke” could be a value for the gamer. We are going on – stay in touch with Tikku! TIKKU Project in the Starting Blocks! Here we are: CHIC 2016 Edition has been launched and we are proud being part of it! Since the Ideation weekend we have been working and brainstorming a lot on Tikku drumsticks project. Although the initial idea was precise enough, we still spent significant time and effort to define a viable value proposition to rouse the attention of potential users. And the work is not finished yet; it is at the beginning! During the following weeks, every Tikku-Member will try to answer tons of questions concerning the technical, design and business parts of the project. For now, the main challenge is to set up the list of the components needed to realize the first prototype. Unlike the other projects, Tikku team should constantly keep in mind, that the quantity of all components is doubled, as well as the costs of material. 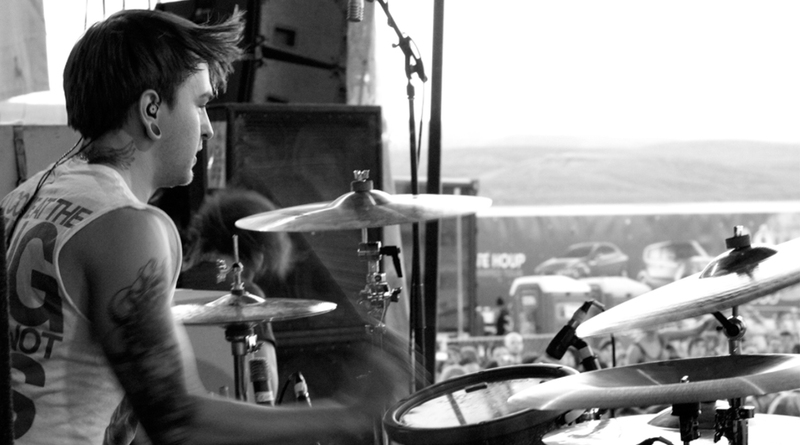 Also, the complexity of making work at the same time 2 drumsticks is quite significant. While engineers are manipulating the technical aspects, the Business and Designing side won’t stay apart! Soon, you will discover new Business Models, Value Propositions and the Customer Journey Map to keep the project well integrated in the daily environment. We are glad to share our passion with you! So come back every week and follow our progress!